View Francisco Franco and over 3,000,000 other topics on Qwiki. 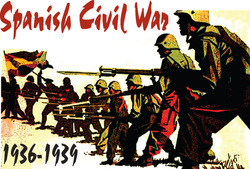 Summary: The Spanish Civil war was between Nationalists (right wing) and Republicans (left wing) after the King abdicated in 1931. This was a test run for Hitlers newly constructed army.